I had a great trip to Lake Eufaula in March. I met Eufaula, Alabama mayor Jack Tibbs to go fishing and get information for a Georgia and Alabama Outdoor News article. And when my club went back in May, I won on some of the places that will be in the August article – they were good in March, good in May and will be good in August!! Jack has been fishing all his life and fishes many tournaments on Eufaula. He came up with an idea for a spinnerbait designed to fish deep ledges on Lake Eufaula, the Ledgebuster, and developed a tackle company from that start. Strike Zone Lures now makes all kinds of lures, including spinnerbaits, jigs, worms and others. It is very successful nationwide. We landed about a dozen bass on Wednesday and the biggest five weighed between 20 and 21 pounds. Although Jack caught most of the fish, I landed the biggest, just under six pounds, and Jack had one about five pounds. I also had one at about four and one-half pounds. All the largemouth hit in three feet of water or less on spinnerbaits, swim jigs and even topwater frogs. The town of Eufaula is historic, with many antebellum mansions and historic sites. I stayed at beautiful Lakepoint State Park Lodge in a spacious room with a nice view of the lake and marina. Thursday morning before heading home, I relaxed on my private deck, drinking coffee while watching squirrels and more than a dozen different kinds of birds looking for breakfast. The two nights I was there I enjoyed excellent food. The first night I met Jack and his wife at El Jalisco Mexican Restaurant on Broad Street downtown. I got there first and the owner met me at the door. She was friendly and helpful, explaining some of the menu items. When Jack arrived, he was greeted by almost everyone in the front of the restaurant and the owner was surprised he was the person I was meeting for dinner. We had to sit in the very back booth, so Jack and I could talk. Otherwise we would have never been able to talk due to all the people coming up to our table to speak to him. Service was good and the food excellent. I had my favorite, Chili Relleno, and, although a little different than what I am used to, it was very good. The next night we went to the Cajun Corner Grill, on the corner of Broad Street and Highway 431. Although busy, service was good and I really enjoyed the Gumbo and fried scallops. The salad that came with the meal was a surprise, not the usual bland house salad. It had good cheese, cranberrys, orange slices and mushrooms on it. One highlight of the trip was a visit to the big bass monument. Since becoming mayor, Jack has pushed to take advantage of the biggest resource of the area, the lake. Fishermen come from all over the US to fish Eufaula and bring in a lot of money to the local economy. 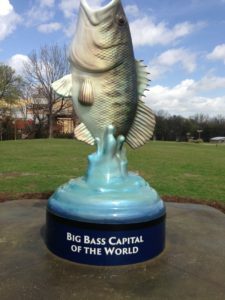 This year the city unveiled the bass monument, with the town’s motto “The bass capitol of the world” on it. That self-proclaimed motto is hard to argue with since Eufaula is known for its quality bass fishing, but people flock to the lake to catch crappie, too. Eufaula is about 2.5 hours away and is worth a trip for the food and sights, but the fishing is always the highlight. This entry was posted in Bass Fishing, Where To Fish on June 9, 2018 by ronniegarrison.